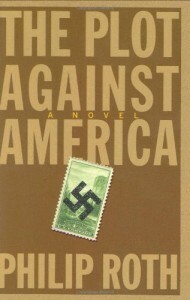 I came to this book not out of interest in the novels of Philip Roth, but as a fan of alternate history. And this book is unlike any alternate history novel I have ever read, or am ever likely to read. In essence, it's a faux-memoir of the childhood of "Philip Roth," a Jewish kid growing up in an America where Charles Lindbergh became president in 1940. Events are told through his first-person perspective supplemented by secondhand summaries of the activities of other members of his family (particularly her aunt and a rabbi who becomes a close associate of Lindbergh). Through them, Roth recounts the emergence of a climate of fear, one that fractures his family as they react to the increasingly ominous measures undertaken by the administration. Unlike the alternate-history novels of Harry Turtledove and Robert Conroy, there are no accounts of great battles or leaders making decisions, just the activities of a Jewish boy and the members of his household. It makes for a surprisingly fresh approach, one that captures a human perspective often lacking in alternate history works. If there is a flaw, it is one common to authors new to the genre, as Roth evidently never considers the butterfly effect of the changes he wrought, with key events that should have been changed by the divergence playing out as though nothing different had happened. This is a minor quibble, though, in a novel of alternate history that, with its intimate focus, stands out within an increasingly crowded field.